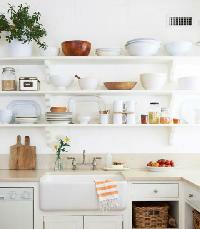 simple to the sublime, our collection of fabulous kitchen ideas. 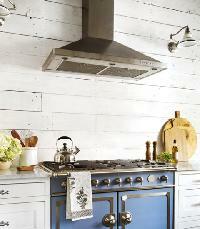 This handsome cook space on a farm in New York s Hudson Valley was once a horse stable. The oak built ins are made from a 150 year old white oak tree that fell on the property, giving new meaning to locally made goods. 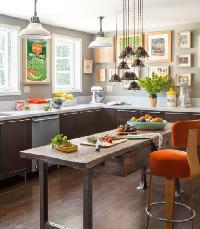 The owner of this Oregon home skipped a dishwasher and opted for this 1953 farm house sink that can handle a lot of dirty dishes and more under counter space. An old soda crate corrals cleaning supplies under the sink. Carrara marble upgrades Ikea cabinets in the kitchen of this California cottage. Task lighting comes in the form of suspended Edison bulbs, covered with Victorian wire shades. The homeowner framed a 1960s supermarket ad as a cheeky homage to Andy Warhol s soup can. The walls are painted Coventry Gray by Benjamin Moore. The kitchen in this California home was enlarged by combining it with the formal dining room and updating it with fresh takes on vintage country style all while maintaining the space s original yellow and red color scheme. 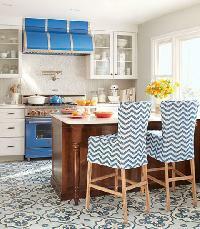 This owner of this Texas home decided to splurge on a colorful range, then worked on reviving the rest of the space. 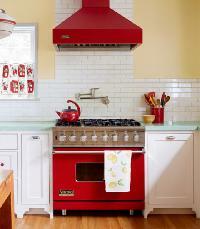 Generally speaking, vintage and vintage inspired appliances have a smaller footprint than modern day behemoths. They can also add decorative charm and a welcome pop of color! in a small space. 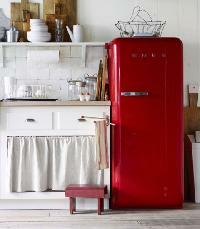 This 50s style Smeg refrigerator is just under 24 wide compared to the 36 width of many standard modern models . Glass front upper cabinets allow the owner of this New York home to flaunt her prized plates without eating up precious floor space, while closed ones below hide supplies. 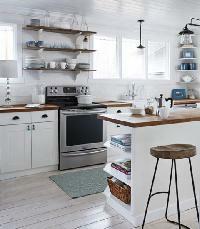 Beadboard panels add subtle texture. The owner of this Alberta farmhouse skipped curtains to lighten up the room s look and maximize views of the scenic property. Minimalist iron and glass pendant fixtures cast plenty of light on the work spaces without blocking sight lines, while wooden shelves, countertops, and stool seats add warmth.